Note: Occasional spoilers do come up during the interview! You've been warned, but otherwise enjoy. Both funny actors in their own right, Riggle is a fine, comedic actor, and Dave Franco is quickly building steam with prominent roles in Greenberg and Fright Night. Riggle plays the high school gym teacher Tatum and Hill's undercover cops must contend with, while Franco plays the cool kid in school, that perfect guy who everyone just seems to like. He's the new kind of cool kid in 21 Jump Street. Don't let the fact that it's a feature film update of one of the first TV shows on Fox. That was back when Fox hardly had any money, and could only afford "up-and-coming" stars like Johnny Depp. 21 Jump Street is a hilarious comedy and worth seeing. Thank you Rob, Dave and everyone at Columbia. 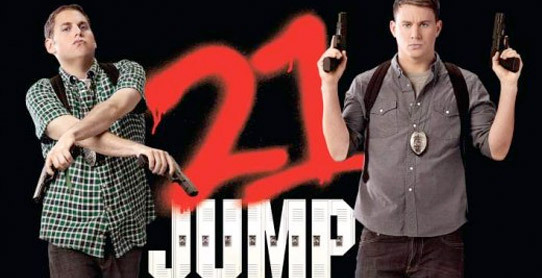 21 Jump Street opens March 16th this weekend. It's a kind of disgrace, really, having to watch great actors recorded by not so great handheld flip. I know, I know... But at least a mini tripod and an external mic, please? Having said that, Rob Riggle is always fun to watch! POW! I have a mini tripod, but the way the table sat and, as tall as Riggle is, It kept cutting off the top of his head. I wasn't gonna ask him to move back, and did the best I could do.